This pint-sized clicker can make television viewing both safer and easier. Updated to cover the Weemote 2 and Weemote Sr. Yes, it’s a "Weel" remote! I can see you looking at the photograph of this remote, and thinking, "how exactly does this fit in as a mid- to high-end remote control?" Well, actually it doesn’t. But if you’ve got a small child or two in the household, you could think of the $25 Weemote as the perfect decoy for your $300 doesn’t-like-to-be-dropped-or-spilled-on deluxe universal – a safety device, in more ways than one. Even if you haven’t yet purchased a high-end remote, it would be a lot wiser to put this cute little product in your child’s hands rather than the original remotes that often cost three times what they’re worth to replace. 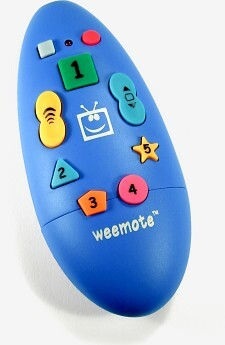 The concept behind the Weemote is clever: kids like the idea of having their own easy-to-use remote control, while parents can program it to access only specific channels. 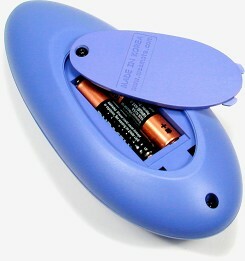 The base Weemote is almost toy-like in nature, targeted to ages 3 to 8 with a bright blue elongated plastic egg shape. The entire case is curved around the sides, except for the bottom which flattens out around the battery case. The remote features 11 large buttons – Power, Mute, Channel Up/Down, Volume Up/Down, plus five other brightly colored ones labeled from 1 through 5, each with their own unique shape. Between the power and mute buttons is a red LED that is used to indicate when the remote is transmitting a signal, or to aid in programming. While the operational purpose of most buttons is obvious, the five brightly colored ones are special in that they can be programmed with the child’s favorite channels – so if he or she likes Nickelodeon the most, button  can be programmed to enter in that channel in a single push. Not a completely original concept, but the innovative application in a remote targeted strictly to kids was brilliant. Not many young children will want to flip their way through CNN and Court TV while getting to the Cartoon Network, so the favorite channel buttons will likely be a big hit. On the bottom side of the remote are two screws. One holds the battery compartment closed – so prying hands can’t get at the two AAA batteries – while the other, located right at the bottom, secures a cover over the small parental programming panel. Undoing this screw reveals a special section with six more buttons that are used to program the Weemote. They read as TV, STB (Set Top Box), FAV, 100, 10 and 1. Since there’s a limited number of buttons, programming the Weemote can be a bit cryptic –	but as there’s so little to be done, it doesn’t take much time at all. To program a preset TV code, hold the "TV" button for three seconds. When the LED at the top begins to blink, you enter the proper code using the three number buttons. So if the code you want is "123", you’d press the  button once,  button twice and  button three times. Other options let you configure whether the remote should send "Enter" each channel change, or whether three digits must be entered including leading 0’s, as for channel "008".